On Friday, there was a secret sister swap. I had opted out because I have been working very hard at being more realistic with my time commitments and didn’t want to sign up for a spot and then be scrambling at the last minute to pull something less than stellar together for my person. I knew I would miss out on something fun, but I didn’t want to disappoint someone, so it was okay. After the swap, Mel said, “Wait, there’s one more!” In addition to all the goodies they had brought for their secret sisters, they had also brought me gifts. Here I was, so happy that they were all here, amazed that they had all been willing to make the trip and they thought they should bring me gifts? I was overwhelmed before I even looked at the contents of the bag Mel handed me. And when I pulled out this? I cried. This is the wall quilt Vanessa made. See those white spaces in the border? The pen we had stopped to get earlier in the day was so that everyone could sign their name on it. It’s kind of like the quilter’s version of the camp t-shirt everyone signs at the end of camp, only so much more awesome. Perhaps if I start mine now I’ll be ready. I wonder what the girls were thinking when we drove down this road and I left them at the retreat. Really, I didn’t mean to leave them for as long as I did, but I had to go get food. The retreat location was in this gorgeous out of the way place, but it was really out of the way. Quiet and calm, so relaxing, but not close. And I needed to go to Costco, a little over an hour away. Of course, this was partly due to the fact that I was apparently planning to feed a football team of teenage boys. Oops. Well, at least we had enough food, right? Once everyone arrived and got settled, there was even some sewing. 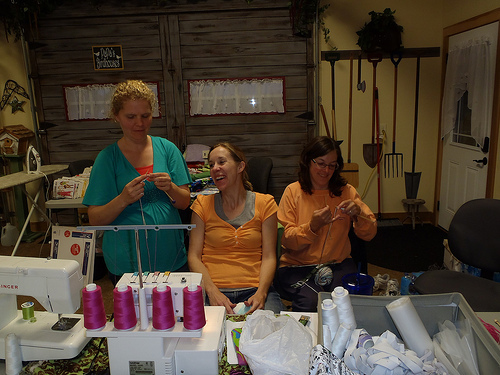 And Vanessa (left) tried to teach Melissa (middle) and Melanie how to knit one night. Some ladies brought a few of their extra fabrics to share and Vanessa thought this gnome fabric would make a great addition to the retreat house’s sitting room. Here are Steph and Kathleen hard at work! Thanks to Mel for the photos! 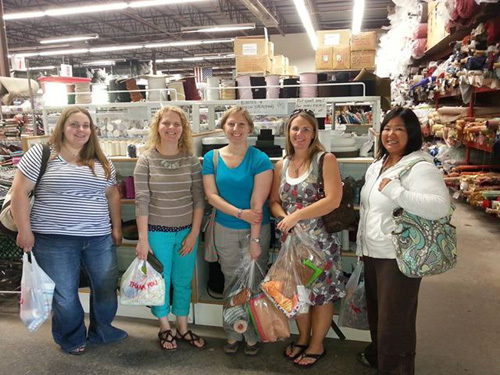 This weekend, fifteen Sewing Mamas gathered in Lester Prairie, Minnesota. They came from Texas, California, Indiana, Missouri, Virginia, Illinois, South Dakota, Iowa, and, of course, Minnesota. It was fantastic. We laughed ourselves to tears, drank some wine, and discovered that, though we’d never met in person before, we were already friends. We started talking about this last fall. There were many moments when I thought, “What in the world was I thinking agreeing to organize this? I’m not good at people!” Because here’s a secret. I’m really very shy. Very, very shy. And it’s easier to chat with people on a sewing board on the internet because they aren’t really there with you. You never see their face so you can’t tell if someone is looking at you like you’re nuts. The week before this event, I told my husband I was never going to do this again, it was a terrible idea. And honestly? If others on our sewing board had planned this somewhere else, I would have had a thousand reasons not to go. And I would have missed out on something fabulous. I went to the airport on Friday to pick up Mel, Kelly, Ruth Ann, Rachael, and Jeri. My stomach was in knots. I got a text from Ruth Ann that they were all there while I was stuck in traffic. But when I spotted them at the airport pickup and recognized Mel and Jeri from pictures they’d shared on the board? I waved at them like a crazy person. I may not have met these girls in person before, but I *knew* them. And I resisted hugging all of them so they might not figure out right away that I am a crazy person. And then I drove an hour to the retreat location and left them all by themselves for 3 or so hours. But more on that later. This is getting too long.